© Michal Praszalowicz; Licensee Bentham Open. We argue that geometrical scaling (GS) proposed originally in the context of Deep Inelastic Scattering (DIS) at HERA works also in pp collisions at the LHC energies and in NA61/SHINE experiment. We show that in DIS GS is working up to relatively large Bjorken x ~ 0.1 . As a consequence negative pion multiplicity pT distributions at NA61/SHINE energies exhibit GS in mid rapidity region. For y ≠ 0 clear sign of scaling violations can be seen when one of the colliding partons has Bjorken x ≥ 0.1 . Finally, we argue that in the case of identified particles GS scaling is still present but the scaling variable is a function of transverse mass rather than pT. Keywords:: Gluon saturation, low x physics, geometrical scaling. This talk based on refs. [1-6] (where also an extensive list of references can be found) follows closely an earlier report of ref. . We shall discuss the scaling law, called geometrical scaling (GS), which has been introduced in the context of DIS . It has been also shown that GS is exhibited by the pT spectra at the LHC [1, 3] and that an onset of GS can be seen in heavy ion collisions at RHIC energies . At low Bjorken x < xmax gluonic cloud in the proton is characterized by an intermediate energy scale Qs (x), called saturation scale [9, 10]. Qs (x) is defined as the border line between dense and dilute; gluonic systems (for review see e.g. refs. [11, 12]). In the present paper we study the consequences of the very existence of Qs (x); the details of saturation phenomenon are here not of primary importance. Here we shall focus of four different pieces of data which exhibit both emergence and violation of geometrical scaling. In Sect. 2 we briefly describe the method used to assess the existence of GS. Secondly, in Sect. 3 we describe our recent analysis  of combined HERA data  where it has been shown that GS in DIS works surprisingly well up to relatively large xmax~0.1 (see also ). Next, in Sect. 4, on the example of the CMS pT spectra in central rapidity , we show that GS is also present in hadronic collisions. For particles produced at non-zero rapidities, one (larger) Bjorken x=x1 may be outside of the domain of GS, i.e.x1>xmax, and violation of GS should appear. In Sect. 5 we present analysis of the pp data from NA61/SHINE experiment at CERN  and show that GS is indeed violated once rapidity is increased. Finally in Sect. 6 we analyze identified particles spectra where the particle mass provides another energy scale which may lead to the violation of GS, or at least to some sort of its modification . We conclude in Sect. 7.
is the saturation scale. Here Q0 and x0 are free parameters which, however, are not of importance in the present analysis, and exponent λ is a dynamical quantity of the order of λ ~ 0.3. Throughout this paper we shall test the hypothesis whether different pieces of data can be described by formula (1) with constantλ, and what is the kinematical range where GS is working satisfactorily. should be equal to unity independently of τ. Here for some xref we pick up all xi < xref which have at least two overlapping points in Q2. For λ≠0 points of the same Q2 but different x's correspond in general to different τ's. Therefore one has to interpolate σ(xref,τ(xref,Q2;λ)) to Q2k,ref such that τ(xref,Q2k,ref;λ)=τk. This procedure is described in detail in ref. .
where the sum over k extends over all points of given xi that have overlap with xref, and Nxi,xref is a number of such points. In the case of DIS the relevant scaling observable is γ* p cross section and variable x is simply Bjorken x. In Fig. (1) we present 3-d plot of λmin(x,xref) which has been found by minimizing (5). Three dimensional plot of λmin(x, xref) obtained by minimization of Eq. (5). where F is a universal dimensionless function of the scaling variable (2). Therefore the method of ratios can be applied to the multiplicity distributions at different energies (Wi taking over the role of xi in Eq. (4))1. For Wref we take the highest LHC energy of 7 TeV. Hence one can form two ratios RWref,Wi with W1 = 2.36 and W2 = 0.9 TeV. These ratios are plotted in Fig. (2) for the CMS single non-diffractive spectra for λ = 0 and for λ = 0.27, which minimizes (5) in this case. We see that original ratios plotted in terms of pT range from 1.5 to 7, whereas plotted in terms of they are well concentrated around unity. The optimal exponent λ is, however, smaller than in the case of DIS. Why this so, remains to be understood. For y > 0 two Bjorken x's can be quite different: x1 > x2. Therefore by increasing y one can eventually reach x1 > xmax and GS violation should be seen. For that purpose we shall use pp data from NA61/SHINE experiment at CERN  at different rapidities y = 0.1-3.5 and at five scattering energies W1,...,5 = 17.28, 12.36, 8.77, 7.75 , and 6.28 GeV. In Fig. (3) we plot ratios R1i = RW1,Wi (4) for π- spectra in central rapidity for λ = 0 and 0.27. For y = 0.1 the GS region extends down to the smallest energy because xmax is as large as 0.08. However, the quality of GS is the worst for the lowest energy W5. By increasing y some points fall outside the GS window because x1 ≥ xmax, and finally for y ≥ 1.7 no GS is present in NA61/SHINE data. This is illustrated nicely in Fig. (4). In ref. we have proposed that in the case of identified particles another scaling variable should be used in which pT is replaced by mT=mTm=mT2+mT2m(mTscaling), i.e. However this choice (mT=pT – scaling) does not really differ numerically from the one given by Eq. (9). To this end let us see how scaling properties of GS are affected by going from scaling variable τpT = τ (2) to mT (9) and what would be the difference in scaling properties if we had chosen pT as an argument in the saturation scale leading to scaling variable mTpT (10). This is illustrated in Fig. (5) where we show analysis  of recent ALICE data on identified particles . In Fig. (5a-c) full symbols refer to the pT – scaling (2) and open symbols to mT – scaling or mTpT – scaling. One can see very small difference between open symbols indicating that scaling variables mT (9) and mTpT (10) exhibit GS of the same quality. On the contrary pT – scaling in variable τpT(2) is visibly worse. for λ =0. 27. One can see that no GS has been achieved in the latter case. Qualitatively the same behavior can be observed for other values of λ. In ref. we have shown that GS in DIS works well up to rather large Bjorken x's with exponent λ = 0.32-0.34. In pp collisions at the LHC energies in central rapidity GS is seen in the charged particle multiplicity spectra, however, λ = 0.27 in this case . By changing rapidity one can force one of the Bjorken x's of colliding patrons to exceed xmax and GS violation is expected. Such behavior is indeed observed in the NA61/SHINE pp data . Finally we have shown that for identified particles scaling variable τ of Eq. (2) should be replaced by mT defined in Eq. (9) and the scaling exponent λ ≈0.3 . 1 For pp collisions we define ratios RWref,Wi as an inverse of (4). Many thanks are due to the organizers of this successful series of conferences. This work was supported by the Polish NCN grant 2011/01/B/ST2/00492. (a) McLerran L, Praszalowicz M. Saturation and scaling of multiplicity, mean pT and pT distributions from 200 GeV < sqrt(s) < 7 TeV Acta Phys Pol B 2010; 41: 1917-26.; (b) Saturation and dcaling of multiplicity, mean pT and pT distributions from 200 GeV < sqrt(s) < 7 TeV – Addendum Acta Phys Pol B 2011; 42: 99-103. Praszalowicz M. Improved geometrical scaling at the LHC Phys Rev Lett 2011; 106: 142002. 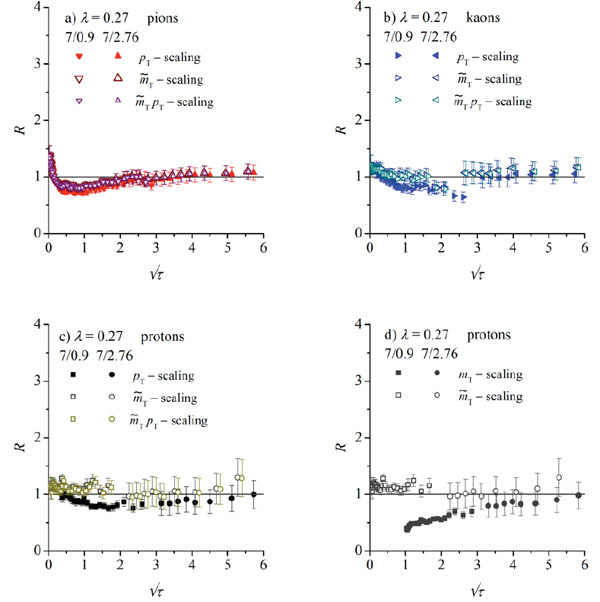 (a) Praszalowicz M, Stebel T. Quantitative study of geometrical scaling in deep inelastic scattering at HERA J High Energy Phys 2013; 1303: 090.; (b)Quantitative study of different forms of geometrical scaling in deep inelastic scattering at HERA J High Energy Phys 2013; 1304: 169. Praszalowicz M. Violation of geometrical scaling in pp collisions at NA61/SHINE Phys Rev D 2013; 87: 071502(R). Praszalowicz M. Geometrical scaling for indentified particles Phys Lett B 2013; 727: 461-7. Praszalowicz M. Geometrical scaling in high energy collisions and its breaking Acta Phys Pol B Proceeding 2013; 6: 809-16. Stasto AM, Golec-Biernat KJ, Kwiecinski J. Geometric scaling for the total gamma*p cross section in the low x region Phys Rev Lett 2001; 86: 596-9. (a) Gribov LV, Levin EM, Ryskin MG. Semihard processes in QCD Phys Rept 1983; 100: 1-150.; (b) Mueller AH, Qiu JW. Gluon recombinantion and shadowung at Small Values of x Nucl Phys 1986; 268: 427-52.; (c) Mueller AH. Parton saturation at small xand in large nuclei Nucl Phys 1999; B558: 285-303. (a) Golec-Biernat KJ, Wüsthoff M. Saturation effects in deep inelastic scattering at low Q**2 and its implications on diffraction Phys Rev D 1998; 59: 014017.; (b) Saturation in diffractive deep inelastic scattering Phys Rev D 1999; 60: 114023. McLerran L. Matter at very high energy density: 3 Lectures in Zakopane Acta Phys Pol B 2010; 41: 2799-6. (a) Adloff C, Andreev V, Andrieu B, et al. 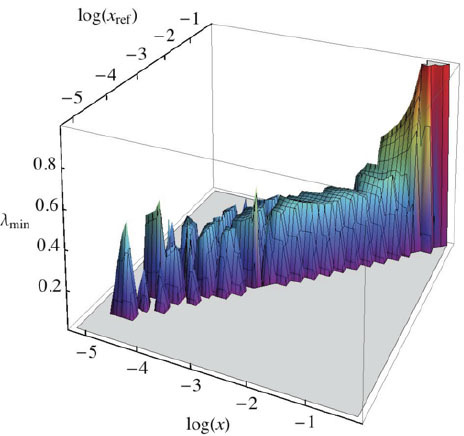 [H1 Collaboration] Deep-inelastic inclusive ep scattering at low x and a determination of alpha_s Eur Phys J C 2001; 21: 33-61.; (b) Chekanov S, Derrick M, Krakauer D, et al. [ZEUS Collaboration] Measurement of the neutral current cross section and F_2 structure functionfor deep inelastic e+ p scattering at HERA Eur Phys J C 2001; 21: 443-71. Caola F, Forte S, Rojo J. HERA data and DGLAP evolution: Theory and phenomenology Nucl Phys A 2011; 854: 32-44. (a) Khachatryan V, Sirunyan AM, Tumasyan A, et al. [CMS Collaboration] Transverse momentum and pseudorapidity distributions of charged hadrons in pp collisions at sqrt(s) = 09 and 2 6 TeV J High Energy Phys 2010; 1002: 041.; Transverse-momentum and pseudorapidity distributions of charged hadrons in pp collisions at sqrt(s) = 7 TeV Phys Rev Lett 2010; 105: 022002.; Charged particle multiplicities in pp interactions at sqrt(s) = 09, 236, and 7 TeV J High Energy Phys 2011; 1101: 079.